Edinburgh is the compact and hilly capital city of Scotland that offers a vast and varied range of activities that the whole family will enjoy. As well as an expansive parkland formed from an extinct volcano, the city boasts Scotland’s premier tourist attraction with its impressive castle, as well as countless museums and art galleries. Edinburgh also plays host to the world-famous annual multi-arts Fringe Festival, and the Royal Military Tatoo which draws thousands of visitors each year. In addition, there are loads of fantastic pubs and restaurants, and the shopping experience is one of the best in Scotland. Edinburgh is an international travel hub thanks to the excellent Edinburgh International Airport which is easily accessible from Europe and North America, while superb rail and bus links ensure that getting into the city is simple. For information on how to reach Edinburgh and travel inside the city once you arrive, please visit the travel information page of the This Is Edinburgh site. Edinburgh Airport lies 8km to the west of Edinburgh and is the third biggest in the UK in terms of airport passenger numbers. Travel within the city is easy and visitors can get to and from the airport by bus, tram, car and taxi. Subject to the time of day, the average journey time takes around 30 minutes. A regular airport bus is operated by Airlink 100 and runs every 10 minutes, 24 hours a day from Waverley Bridge (the central train station in Edinburgh city centre). Tickets can be bought at the airport information desk, at the bus stop, from the driver, or online. Full airport bus details are available to view at the Edinburgh Airport website bus and coaches page. Alternatively, visitors can take a tram ride into the city centre which takes around 40 minutes. For further information for travellers arriving and departing from Edinburgh Airport please visit The Edinburgh Airport Guide. 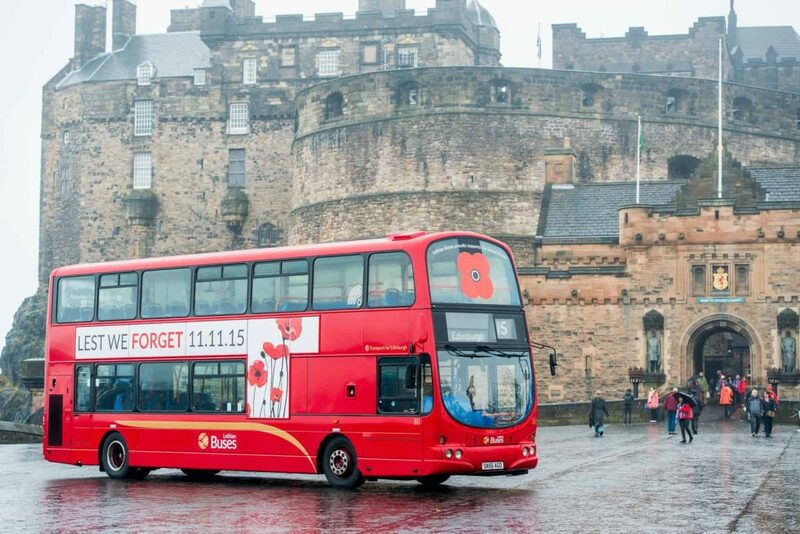 Edinburgh has a world-leading bus and tram network thanks to the services provided by Lothian buses, with cheap public transport available on clean, well-maintained vehicles. The bus network extends right through Edinburgh and out to the surrounding areas, while the trams provide a fast mode of transport from over 14km from the airport into the city centre. Visit Transport For Edinburgh for more information on Edinburgh’s Trams and buses or download the Transport for Edinburgh App. To help you find your way around the bus network more quickly you can get real-time information on the web and on your smartphone. Edinburgh’s two major railway stations, Waverley and Haymarket, operate regular services to other parts of Scotland and the UK on a frequent basis. Both stations can be easily walked from the city centre, with the main Waverley station located right in the heart of the city on Prince’s Street. Virgin Trains East Coast provides links from Edinburgh to London, Newcastle, York, Leeds and Aberdeen. Rail travellers can get to Edinburgh from London in under five hours. Virgin Rail operates a service on the west coast to London via Lockerbie, Preston, Birmingham and Coventry. Caledonian Sleeper is a popular overnight service operating between Edinburgh and London (Euston) every night (except Saturday). ScotRail operates a full schedule of trains throughout Scotland. Edinburgh is a compact city so there is no need to hire a car if you’re only planning to stay in the city centre. However, for those wanting to travel further afield an extensive road network links the city to the rest of Scotland and UK, making access to the capital easy by car. Driving west, Edinburgh to Glasgow can take just over an hour along the M8, and driving north will take around 2 1/2 hours to reach Aberdeen, and 3 1/2 hours to reach Inverness. Newcastle is approximately a 2 1/2 drive, and Manchester and Birmingham take roughly 4 and 6 hours respectively.